Are you encountering Voicemail too often during sales calls? Few seem to answer their phone these days. Calling customers can be frustrating, especially with 80% of phone calls ending in voicemail, and only 20% answering live. Our agents will get past Reception & Personal Assistants to speak with the right contact. If we encounter a LIVE contact, our agents probe for product interest, report back if it’s a good sales lead. If we encounter VOICEMAIL, our live agents will not speak. Instead they “hand-deliver” your recorded sales message into your client’s voicemail box. Our agents become Voicemail Couriers. It will sound like you made the actual phone call. 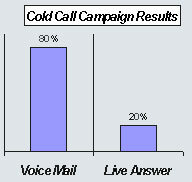 Results: Your message is “guaranteed delivery” on every call. Every agent makes 500-800 calls daily. You get a higher ROI. We email each “interested client” to your sales team within five minutes of discovery. We employ only North American residents to conduct outbound campaigns. Call reports with extensive detail of every call. If you don’t have a contact list, we can help you locate one. We look forward to assisting you with your next Lead Generation campaign.